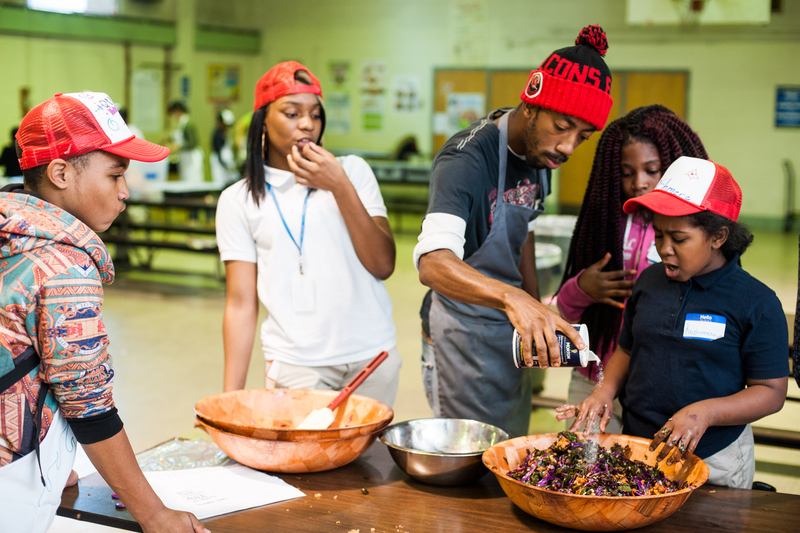 What does youth-centered recipe design look like? Fundemental to youth ownership in Cooking Crew is the youth participation in deciding what they cook. 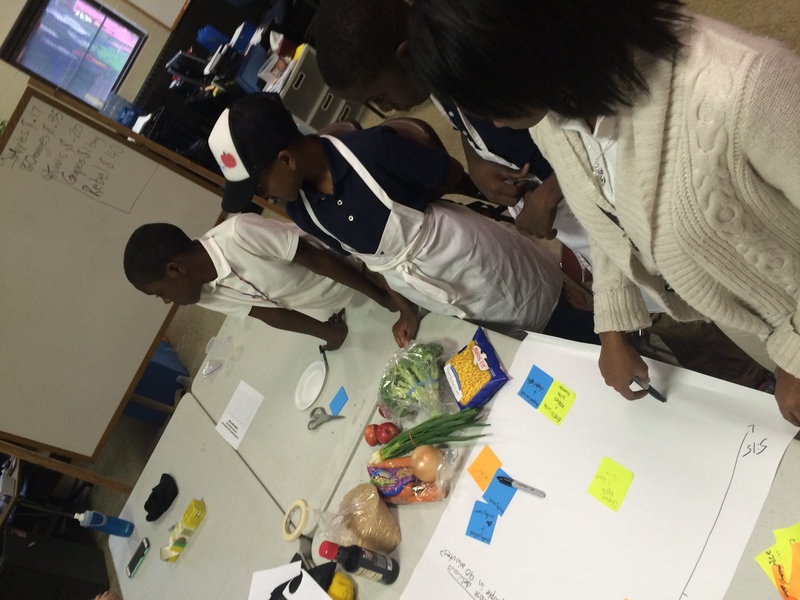 In Cooking Crew we use a design-thinking approach to recipe development. 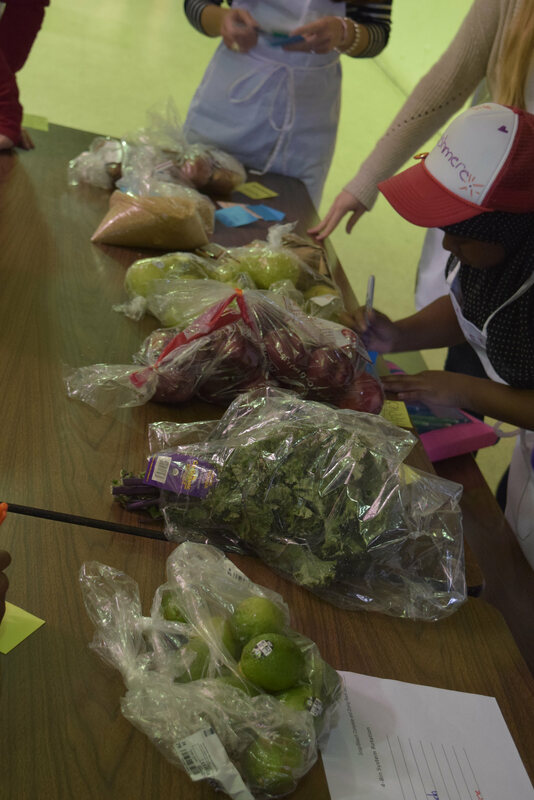 Teams of students and adults, when presented with a basket of fresh produce, work together to create the best eating experience for their community. 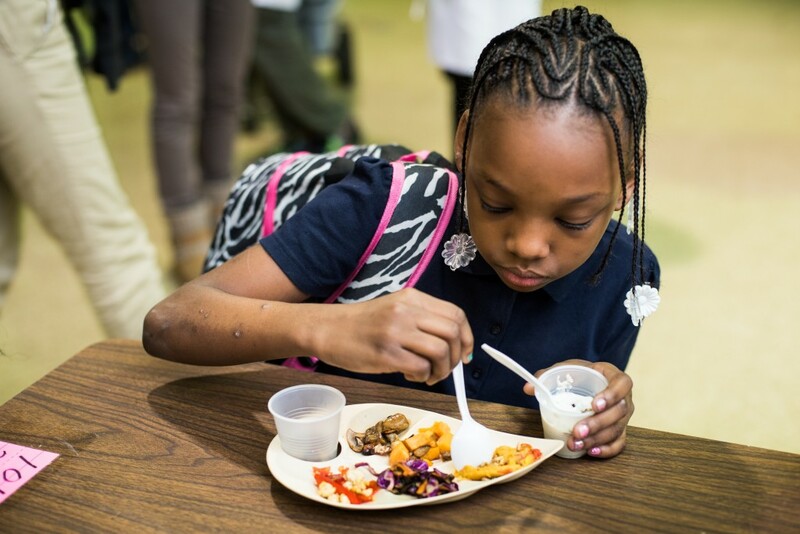 The goals of this approach are to maximize active engagement among participants and to foster culinary curiousity, creativity, and confidence. 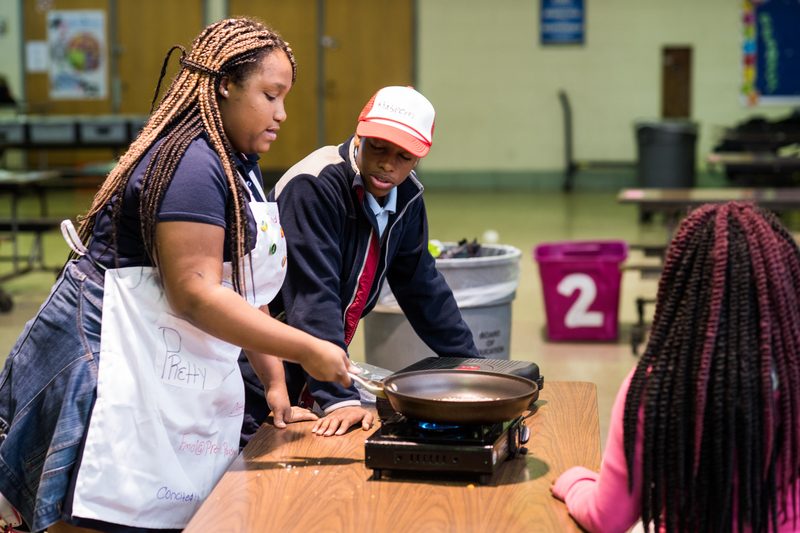 Participants in the Cooking Crew Recipe Design process should be able to open their fridge and pantry at home and feel comfortable preparing a healthy and delicious meal with whatever tools are in the kitchen and without any extra help from cookbooks or parents. The problem the cooking crew recipe design process solves is: how might we create the best eating experience for 100 people in the Comegys after-school program? What are the boundaries for recipe design in cooking crew? The first are structural. There are 90 minutes to set-up, clean-up, serve, and clean-up again. There is no oven in cooking crew, only stove-top burners. Each team has their own set of basic cooking supplies (including mortar and pestles), as well as access to a shared store of pots, pans, griddles, and blenders. The next boundaries involve ingredients. There is a unique market-basket of fresh, seasonal produce that each team is required to use in their recipe. The team is also able to access commonly available pantry items- including whole grains, canned goods, oils, vinegars, spices, and condiments. The final boundaries involve the composition of ingredients and the composition of the meal. 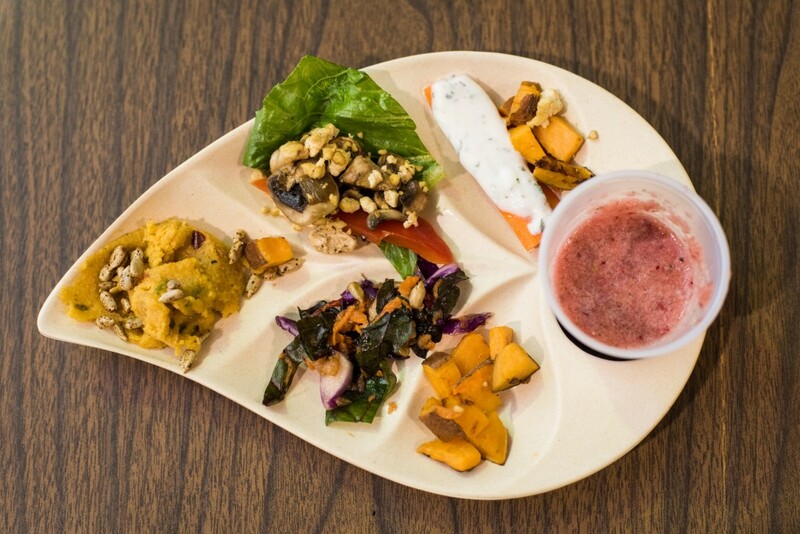 Each dish must be healthy and delicious. Dishes should include a variety of colors, flavors, and textures. Only one team can make a soup/stew. Any team can make a smoothie, it just must be accompanied by another dish using the market-basket ingredients. 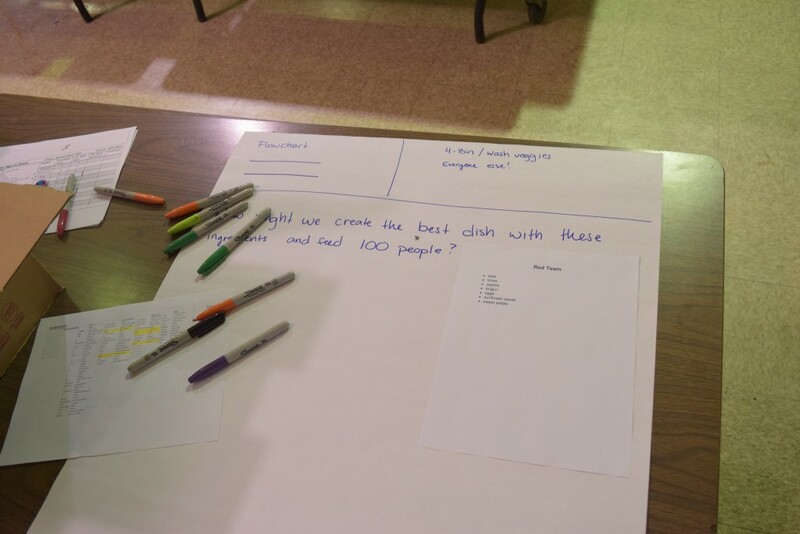 The problem the cooking crew recipe design process now solves is: how might we create the best eating experience within the boundaries of cooking crew for 100 people in the Comegys after-school program? On the top of the Recipe Flowchart write “how might we create the best eating experience within the boundaries of cooking crew for 100 people?” Place all the ingredients next to the flowcard. 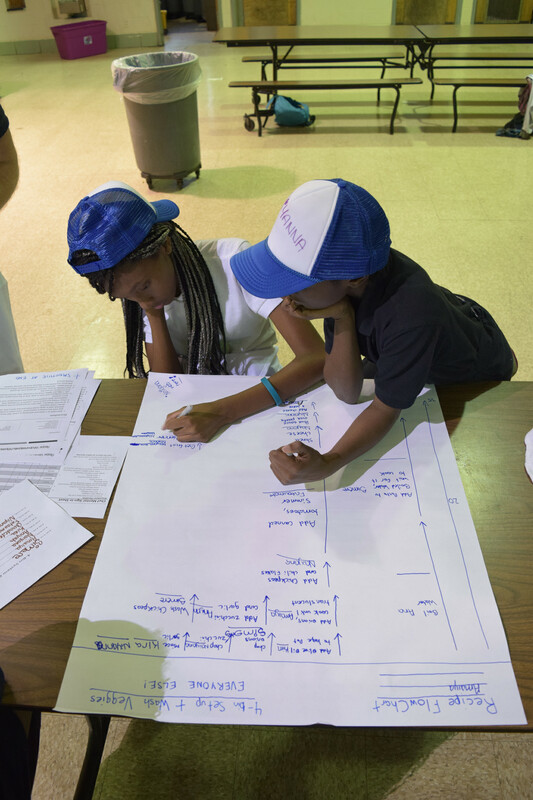 All students and mentors should be able to see the flowchart and ingredients. The facilitator stands closest to the flowchart. Everyone has a stack of 5+ post-it notes and a black sharpie. The facilitator explains the rules. 1. There will be 5 minutes for the brainstorm. 2. There are no bad ideas. Always think ‘yes, and…’. After you have an idea, write it on your post-it and hand it to the facilitator. The facilitator takes the note, reads it outloud, and sticks it on the Recipe Flowchart. 3. One idea per post-it. The idea can be for the flavor of one ingredient, the texture of one ingredient, the flavor and texture of one ingredient, or a way to combine multiple ingredients. It just has to be one clear idea. Good examples of ‘one idea': Crispy onions. Crispy, spicy onions. Crispy onions with spicy carrots. Rice with crispy onions, spicy carrots, and sour cucumbers. Bad examples of ‘one idea': Crispy onions and a peach smoothie. Broccoli with ranch and eggs and potatoes. After 5 minutes of brainstorming, there’s 5 more minutes to reach consensus on the dish. The facilitator leads the team in grouping the post-it notes into like categories to find patterns between the ideas. The dish(es) begins to emerge. The facilitator and team begin to remove post-it notes from the board. After general consensus is reached a few students (as well as at least 1 adult) stay to complete the Recipe Flowchart. 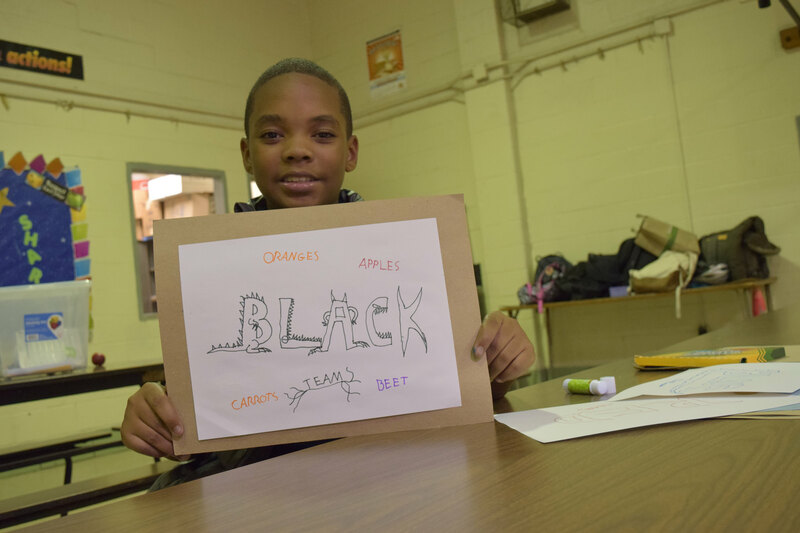 The rest of the students wipe down tables, wash ingredients, gather supplies, and set-up the 4-bin system. When the Recipe Flowchart is finished, all the students sign-up for tasks to complete. Creating the best eating experience requires a combination of discipline and ambition. Discipline is simple. Cook safe, cook clean. Follow the Recipe Flowchart and follow the 4-bin sign-in sheet. Cut like a samurai warrior. When you’re not cooking you’re cleaning. It takes great courage to try something new. To succeed in cooking crew you must have an open mind. Try things raw, try things cooked. Tasting spoons are a chefs best friend. Layer flavors and textures until they are balanced. We eat with our eyes first. How will you present the food? Experiment with different colors and shapes. Should there be a garnish, a sauce, or a spice blend on the side? After our eyes, we eat with our ears. Communication is key. How might we best present the food to the eater? What should the eater see and hear? Is there a name of the dish? What is in it? Why is it delicious? Why is it healthy? Are there any instructions for eating or suggestions for seasoning? Students and mentors should practice, practice, practice. Role play the service experience.